and we'd be happy to help! 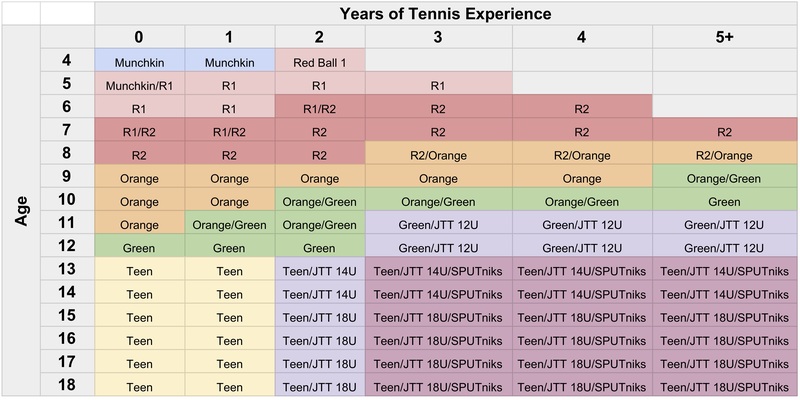 Use the table below to find our recommendations on where to start as a junior player. Simply find the intersection of years played and age. That said, one size does not fit all, so please know that these are guidelines so if the shoe doesn't fit, try another option! If you're just picking up a racquet for the first time or learning the basics of scoring, one of our beginner classes would be a great place to start. Join adults of all ages in a great social atmosphere. When spins start coming into play and you feel confident that the ball will generally go in the direction you want, feel free to claim the Intermediate tag. Great places to continue growing your game are with our cardio classes. You've got a full bag of shots in your arsenal and want to test your tennis wits against other students of the game. Try our World Team Tennis league and put your abilities to the test in a fun and cooperative atmosphere! Join as a team or as an individual (we'll find some good folk for you to join) and enjoy!